myHeritage.org experienced some technical trouble earlier this week. We haven’t been able to post new content and you may have had difficulty sending us your comments. Everything should be back to normal this morning. We apologize for any difficulty this may have caused. It’s always great to hear from you! Sens. 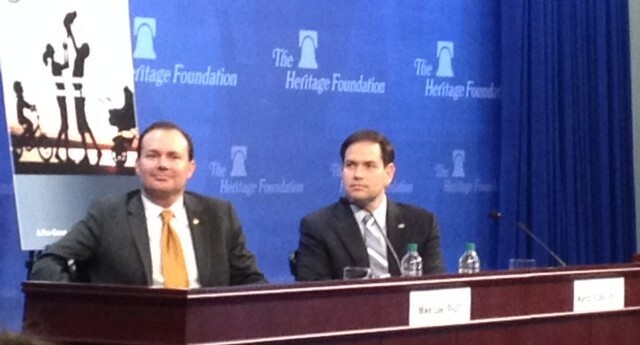 Mike Lee (R-UT) and Marco Rubio (R-FL) at Heritage Wednesday. Speaking today at The Heritage Foundation, Sens. Mike Lee (R-UT) and Marco Rubio (R-FL) made the case for their new tax plan. Our current tax code is so overcomplicated and burdensome, they explained, that it ends up punishing entrepreneurs and savers. Over 90 percent of Americans would see a tax decrease under their proposal. Not only that, their proposal is a “pro-growth and pro-family tax plan,” Lee said, since it institutes a $2,500 child tax credit. The business side of the Lee–Rubio plan is the best business income tax reform plan that has been proposed in Congress in recent memory. The individual side is a modest step in the right direction, but leaves much room for improvement. The business tax reforms are so positive that, taken as a whole, the plan would dramatically improve the economy and the incomes of American families. The Lee–Rubio plan would also increase interest in tax reform and show the way on business tax reform. It will help to make tax reform a reality when there is a President in office who wants to lead the effort. What do you think of the Lee-Rubio tax plan? David Shedd, the former director of the Defense Intelligence Agency, will join the Heritage Foundation as a Distinguished Visiting Fellow in the Davis Institute for International Studies. Shedd will “offer critical insights to the threats and challenges our nation faces,” Heritage President Jim DeMint says. Shedd brings many achievements to the Davis institute including his service as the ODNI Deputy for Policy, Plans and Requirements, and his direct involvement with the 9/11 Commission report in July 2004 and the Weapons of Mass Destruction Commission report in March 2005. You have greater odds of being hit by a meteor than being killed in a terrorist attack, Heritage Foundation national security expert James Carafano said yesterday on MSNBC. But that doesn’t mean you shouldn’t take the threat seriously. Carafano’s new e-book, Surviving the End, explains basic steps you can take to protect yourself and your family from threats ranging from muggings to natural disasters to major terrorist strikes. For this week only, the book is free to download from the PJTV store. John Bolton wears a Heritage necktie on Fox News last week. What can you wear to reinforce your conservative bona fides? 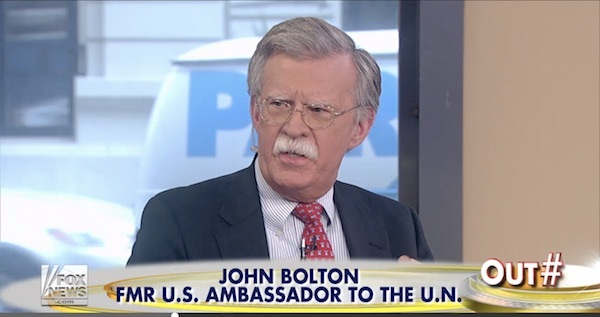 Former ambassador to the United Nations John Bolton chose to wear a Heritage Foundation necktie last week when he responded on Fox News to the President’s comments about ISIS and the Crusades. Get your own silk Heritage Foundation tie, specially produced for Heritage by Vineyard Vines, from the Heritage bookstore. More than twenty conservative lawmakers came to The Heritage Foundation this week to participate in Heritage Action for America’s second annual Conservative Policy Summit. The event helped unify conservatives around a positive agenda, including a 192-page book of policy recommendations from Heritage Foundation experts. The lawmakers who attended have introduced innovative, principled conservative legislation. They agree with Heritage Action — The Heritage Foundation’s sister organization — that for too long the agenda in Washington has been defined by well-connected special interests, not the conservative principles that help the American people. That’s why the Summit focused around the theme of “opportunity for all, favoritism for none.” It’s also why Heritage Action is advocating for practical policy agendas that create opportunities for all Americans and don’t pick favorites. Sen. Ted Cruz (R-TX) gave a stirring speech about the ten ways conservative principles can make American lives better. Watch the video above. The other lawmakers who participated included Sen. Rand Paul (R-KY), Rep. Tom Price (R-GA), Rep. Todd Rokita (R-IN), Rep. Jeff Duncan (R-SC), Rep. Dave Brat (R-VA), Rep. Ken Buck (R-CO), Rep. Barry Loudermilk (R-GA), Rep. Gary Palmer (R-AL), Rep. John Ratcliffe (R-TX), and Rep. Jim Jordan (R-OH). Daily Signal – 60 Seconds With Ted Cruz: How Should GOP Handle Homeland Security Funding in Wake of Paris Terror Attacks? MSNBC: Ted Cruz slams Obama: Why didn’t the president go to Paris? Daily Signal – There Hasn’t Been One Since 2001. Can This New Budget Chair Deliver a Balanced Budget? Do you think America is ready for real conservative leadership? San Francisco hosted a Veterans’ day parade this past weekend. And only a few people showed up. Some blame a lack of publicity. Perhaps. Maybe not everyone chooses to celebrate our veterans by attending a parade. But I wonder: as a nation, are we showing up for our veterans? Are we showing up to remember, support, and help those who choose to serve and fight for us? 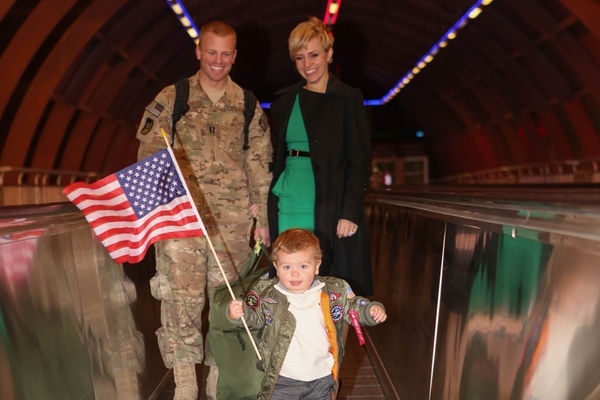 Around this time last year, I was at the airport, anxiously awaiting my husband’s return from a tour of duty in Afghanistan. He’d spent the better part of a year treating our wounded servicemen and women at the Bagram Air Base trauma unit. Our dear friends snapped the candid picture above as we walked through the terminal. We were so happy to be reunited. A few minutes after this photo was taken, I realized the man who left was not the man who came home. He was different because he didn’t come home alone. Phil Crane, the long time Republican Congressman from Illinois and a conservative champion, died Sunday at the age of 84. The news got my attention in a very personal way. Phil Crane won his seat in a special election in 1969. It was Illinois district 12, where I grew up. It was a crowded field and my mother, Eloise Canfield, then just beginning her own career in local politics, was a leader in the small group of people who backed Crane in a nine-way primary. After winning the primary, he went on to win the general election and serve for 35 years in the House. My mother was integrally involved in his subsequent elections in the ’70s and early ’80s. I realized even then he stood out. He was conservative when it wasn’t cool. He gave an intellectual heft to the ideas of free markets and a strong national defense during those wilderness years when few on the national scene were talking about such things. He was anti-communist when nobody was. 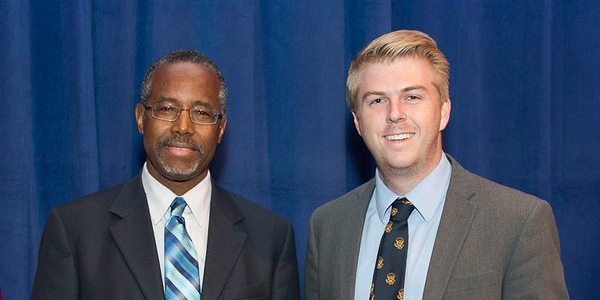 The author with Dr. Ben Carson at the 2014 Heritage Foundation President’s Club Meeting. The first time I ever heard of Ben Carson was in 2012 when he came to speak at my university. He wasn’t a politician back then, just an accomplished but humble man with a hugely inspiring story to tell. I remember the example of his mother more than anything else from his speech. She was an illiterate, impoverished black woman who understood that “once you go on government benefits, you never go off them.” Her faith and hard work are what pushed Ben out of childhood poverty to become the successful person he is today. Now he’s a potential presidential candidate. Just a week before he acknowledged his interest in running, Dr. Carson was at The Heritage Foundation’s annual President’s Club Meeting, where I had the chance to briefly chat with him. I left our conversation feeling like I had met an extraordinarily caring and kind, quiet, unassuming, and gentle person. Later that night, he delivered the President’s Club Meeting keynote address. He spoke about political correctness, taxes, and healthcare — all issues close to the hearts of conservatives. But his sincerity and experience give his words added meaning. As a famous doctor, he knows exactly why he opposes Obamacare (and he has more than a few ideas on how to fix it). Because of his childhood experience in Detroit, he knows about poverty (and has some very good ideas about that too). And as a non-career politician, he says things in a way that you want to hear, without all the hedging and qualifying that so many political leaders employ today. Whether or not he becomes the Republican nominee for president, Ben Carson’s frankness and integrity is a breath of fresh air in a political environment that is sometimes very toxic. At the very least, he has my respect and admiration. The Heritage Foundation is a 501(c)(3) non-profit organization and does not endorse candidates or political parties. The views expressed herein are the author’s own. 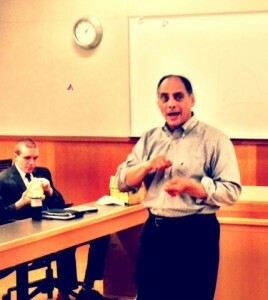 James Carafano speaks at Berekley Law School. The University of California, Berkeley is not known for being sympathetic of conservatives, let alone supportive. But Heritage Foundation defense expert James Carafano found an attentive audience when he visited the Berkeley Law School earlier this month to discuss his book, Wiki at War. Carafano’s book explores how the Internet has changed the nature of warfare and diplomacy. Wikileaks, for example, demonstrates how online vandalism can frustrate our foreign policy. More recently, ISIS and other terrorist groups have used the web to collaborate and recruit.